Antonio Savori achieved some degree of notoriety during his lifetime. He was perhaps best known for the charity balls he catered at the Academy of Music. Located on East 14th Street at Irving Place, this theater was was situated only one block off Union Square, the center of New York’s social life until the early 1880s. Featuring a lavish white and gold interior illuminated by thousands of gaslights, the venue was used for operas, concerts, and even high society balls by removing the 4,000 crimson-velvet seats to create a large dance floor. 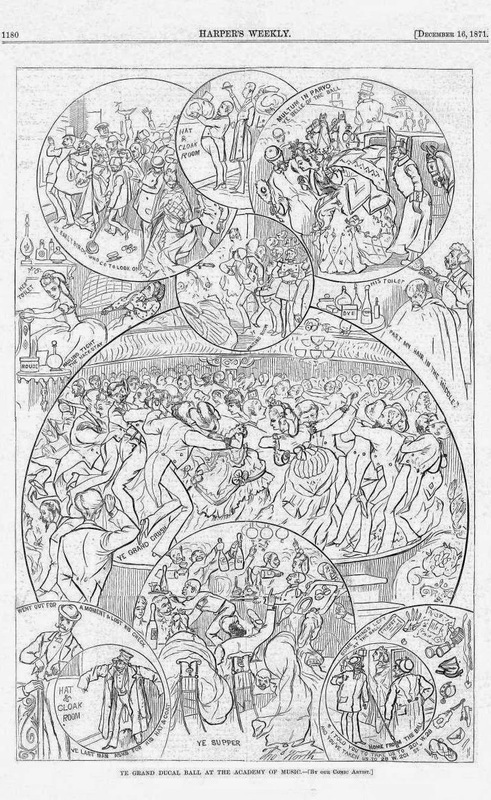 Eleven of the forty-five menus saved by Savori come from ball suppers at the Academy.1 In December 1871, Harper’s Weekly published the comic mosaic below, showing the crowding and confusion that characterized the largest balls. Attended by as many as 4,000 people, these raucous events were often held to honor some visiting member of European royalty. As depicted in one of the vignettes, the chaos on such occasions even engulfed the dining area where the late supper was served. However, the charity balls were smaller, more dignified affairs, organized as annual fundraisers by civic-minded citizens. 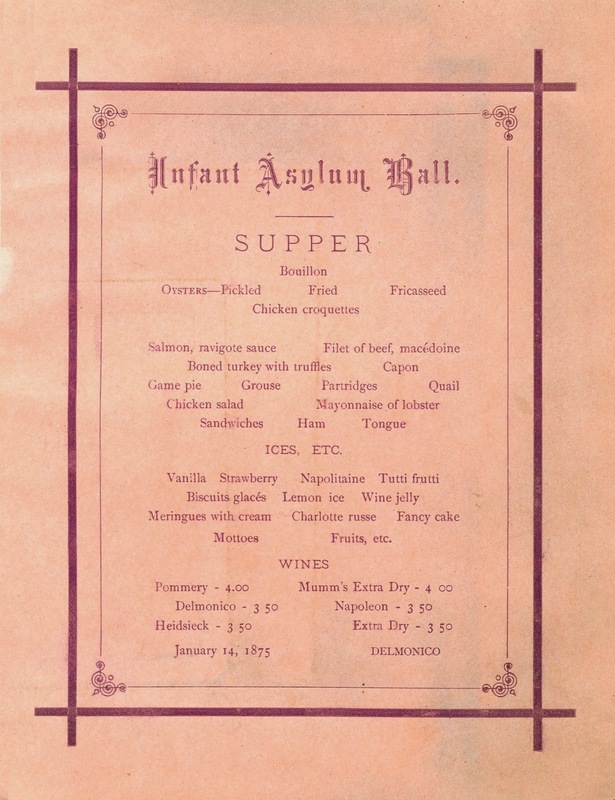 In January 1875, the ball for the Infant Asylum was catered from the famed kitchens of Delmonico’s, situated only about 500 yards away on the corner East 14th Street and Fifth Avenue. Delmonico’s closed this branch the following year and relocated to 26th Street at Madison Square, providing an opportunity for nearby hotels to pick up additional catering business at the Academy. 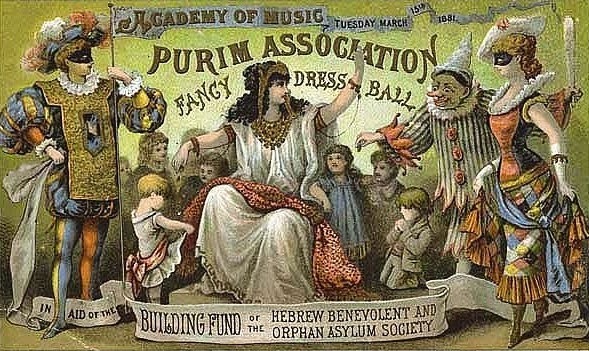 The ball for the Roman Catholic Orphan Asylum in January 1876 was catered by the Union Square Hotel where Sivori was working as the steward. 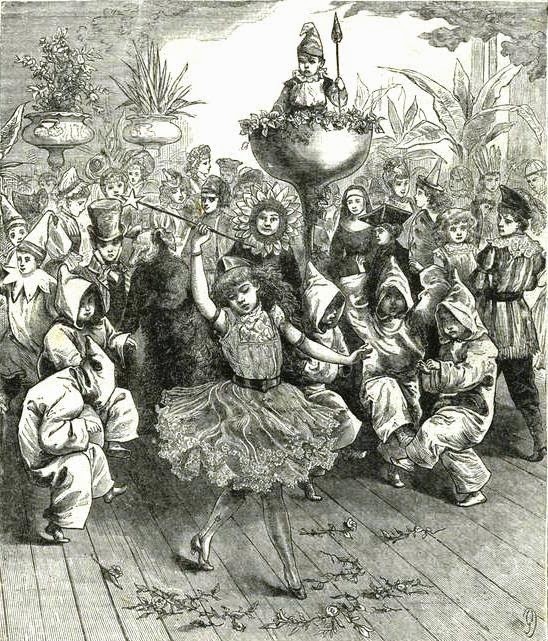 By the mid-1870s, the charity ball was a ritual that followed a distinct pattern of operation. 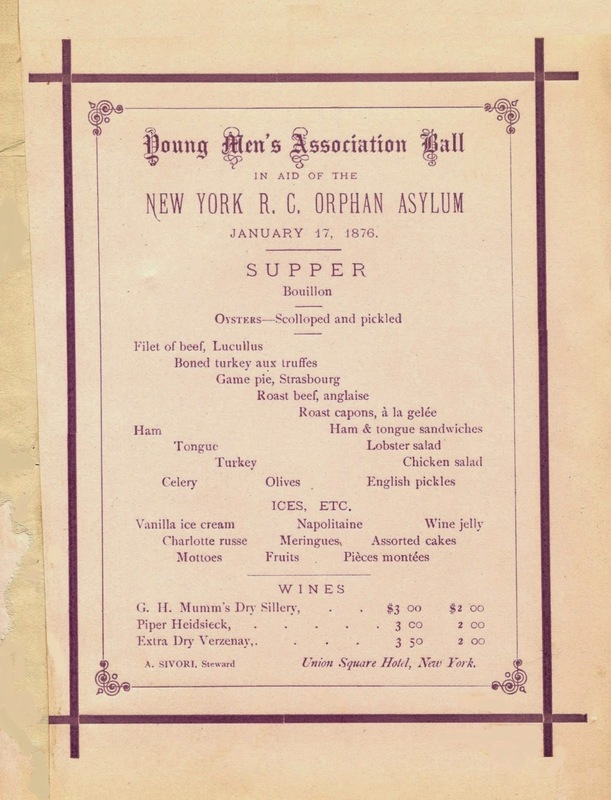 The supper menus from the balls of this period in New York are surprisingly similar in appearance, reflecting a common practice utilized by disparate social groups. The American Centennial in 1876 prompted gatherings at all levels of society to adopt a colonial theme. The St. John’s Guild of Trinity Church held the benefit for its “floating hospital” on George Washington’s birthday, calling the event the Lady Washington Reception. The Guild had recently launched the hospital ship Emma Abbott, named after the opera star who donated money to help build the vessel. The scope of its health services included day trips in the summer to give poor children and their mothers temporary relief from the crushing heat and filth of the city. By December 1877, Sivori was working for the Westminster Hotel on East 16th Street. 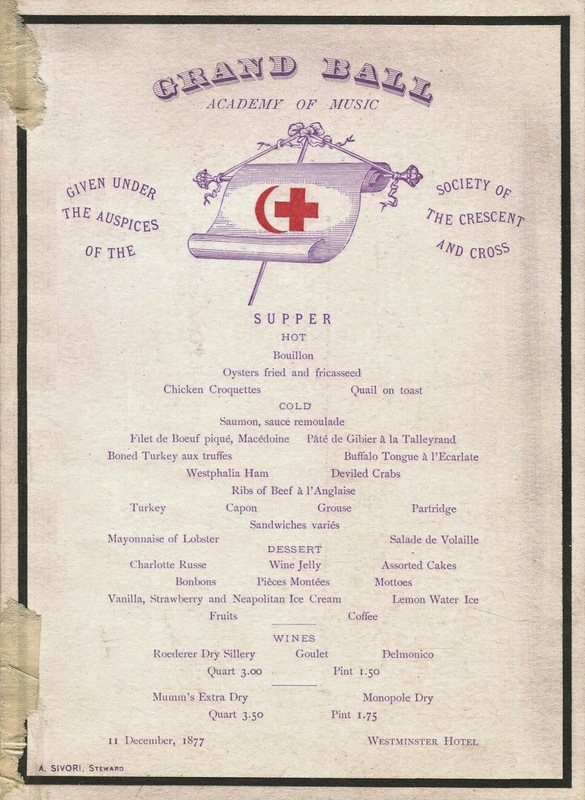 The Grand Ball of the Society of the Crescent and Cross, raising money for soldiers wounded in the Russo-Turkish War, was organized by the Vanderbilts and other wealthy families. Despite the long depression, the industrialization of the United States was still creating vast new fortunes for the wealthiest members of society. A fierce snowstorm on the night of January 31, 1878 delayed the start of the ball for the Children’s Hospital. Many arrived after 11:00 PM. In addition to the usual shrubs and floral decorations, gas jets installed above the balcony spelled out the word “Charity,” making a fiery display of the name by which this particular charity was known. 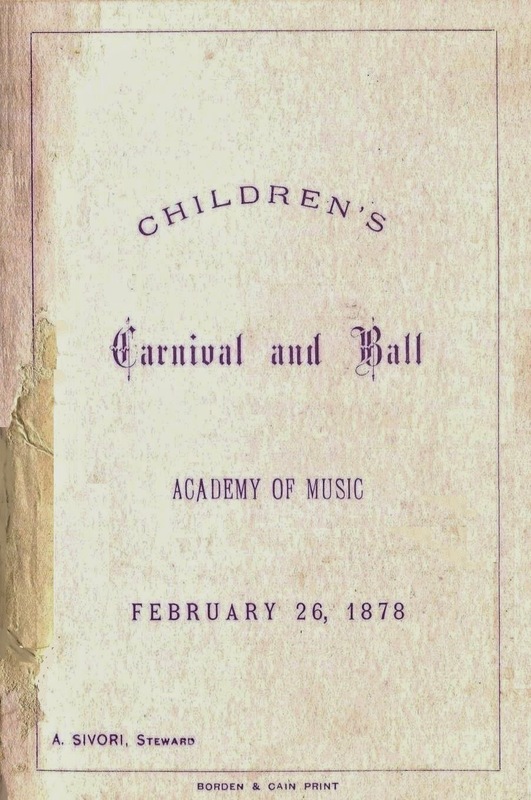 After the performance ended at 10:00 PM, the children were taken home and put to bed by their nurses, while their parents attended the ball and late supper. 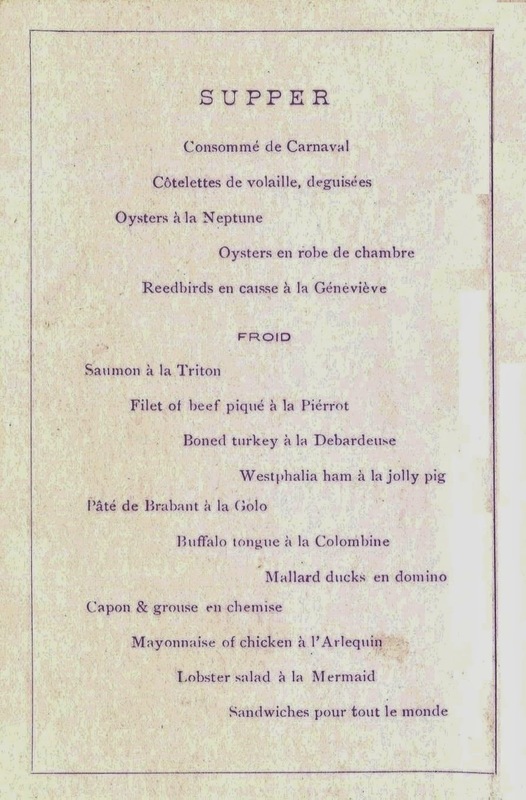 The juvenile theme of this annual upper-class affair is reflected by the whimsical names of the dishes shown below, such as reed birds en casse à la Géneviève, filet of beef piqué à la Piérrot, and Westphalia ham à la jolly pig. 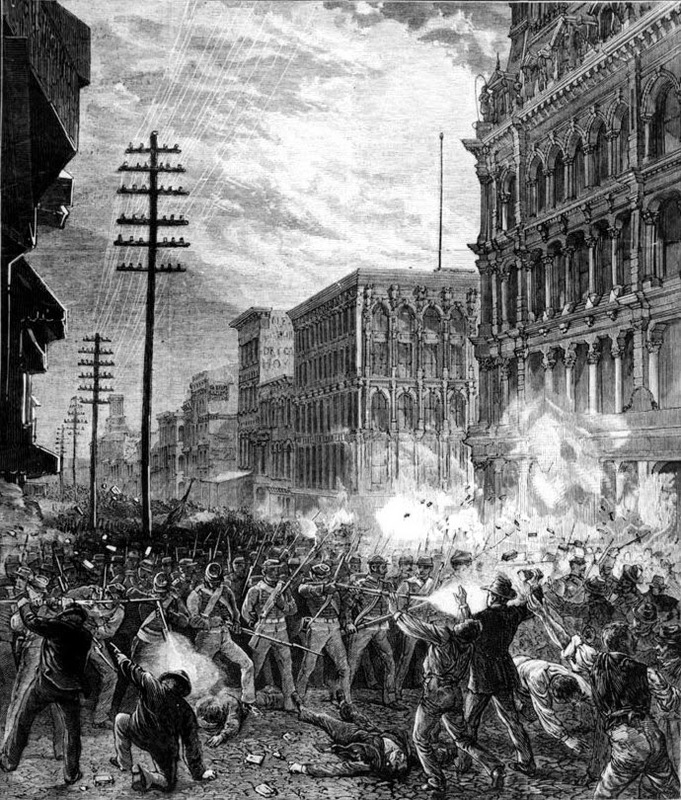 Unemployment finally peaked in 1878, marking the end of the long economic decline. 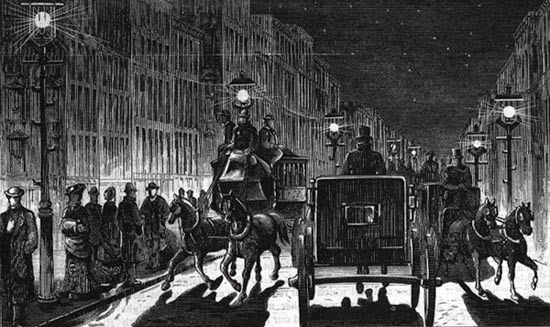 In October of the following year, inventor Thomas Edison demonstrated the first practical light bulb, and in December 1880, the first electric street lights were erected in New York along a twelve-block stretch of Broadway between Union Square and Madison Square. In a city unimaginably dark by today’s standards, the street lights retraced Delmonico’s move three years earlier when it relocated further uptown. Sivori and his family were now living in a hotel he managed at 156 West 23rd Street, one and a half cross-town blocks from Madison Square. 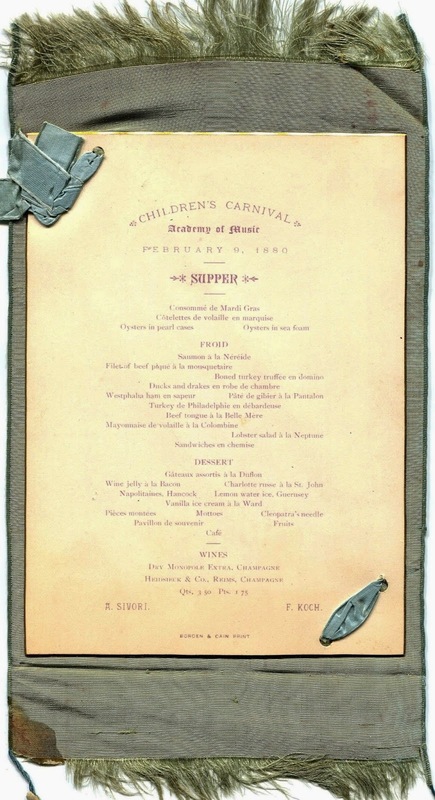 By February 1880, Sivori had partnered with a restaurateur named Koch to cater the annual Children’s Carnival and Ball.2 The fancy menu below comprises an engraved card tatted on a satin backing with a silk ribbon. This expensive design stands in marked contrast to the simple menu from this event two years earlier. As it turned out, there was “a little hitch” at the Children’s Carnival that year. At the end of the performance, Sivori organized a procession of masked waiters to come on the stage as a surprise. According to the New York Times, the waiters were then supposed to lead the children to the dining room where “they were to be furnished with ice cream, whether at so much a plate or not was not definitely understood. But the police promptly put a stop to any masquerading, for which no permit had been obtained. Sivori worked himself into a heat over this interference that will take over a week to cool.”3 This brief article provides a fascinating glimpse of Sivori's personality, suggesting that he had a mercurial temperament, while also intimating that the ice cream may have been a clever ploy to squeeze a few more dollars out of this catered event. 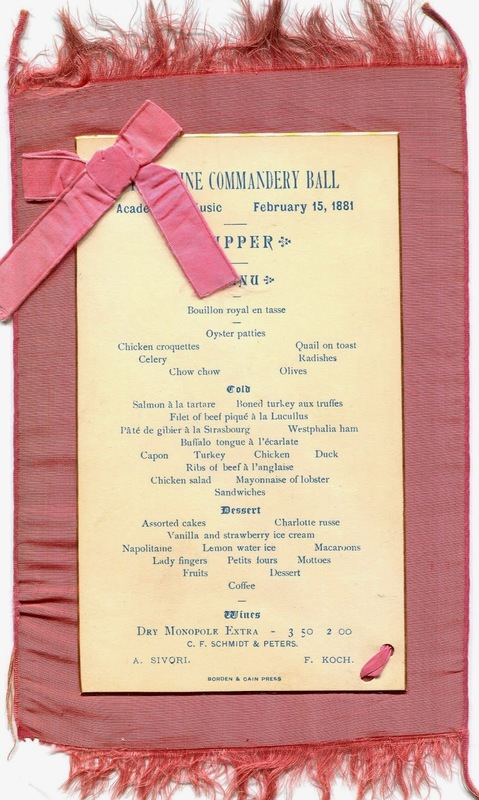 The last menu in this group comes from a ball of the Knights Templar.4 Dated February 15, 1881, the bill of fare is tatted on pink satin with a pink silk ribbon, and is inscribed “Valentine Dinner” on the back. Sivori left the catering business to manage the Brighton Beach Hotel at Coney Island, and later, as a purveyor for the Atchison, Topeka, and Santa Fe Railroad, organized the opening dinner in 1882 of the Montezuma Hotel, the railroad’s new winter resort in Las Vegas, New Mexico. He also became president of the Italian Benevolent Society in 1884, providing relief for immigrants who were now arriving in large numbers from the southern regions of Italy. In addition to frequently changing jobs, he also continued to change his residence. In 1886, he and his wife were living in a hotel on 126 West 42nd Street. By the early 1890s, they had settled into a four-story row house at 252 East 61st Street, having moved uptown in tandem with high society for thirty years. Antonio Sivori died in 1893 at the age of sixty. Interestingly, the newspapers speculated that he was the oldest caterer in New York, and maybe even its oldest Italian-American citizen, possibly taking into account the citizenship status of the newly-arrived immigrants. The obituaries also noted that he had once been one of the city’s most prominent caterers for seven years.5 It was a long time to stay on top of such a highly competitive business. Perhaps his prolonged period of success had been aided by the equally-long depression which served to discourage others from entering the field. It was not until 1879 that the animal spirits of American capitalism revived, and with economic expansion came new wealth. In 1881, Louis Sherry entered the scene, opening a high-end catering service on Sixth Avenue at 38th Street. Although Sherry’s would prove to be very successful, it was no longer possible for any one caterer to reign supreme in New York. The country had entered the Gilded Age, the era of rapacious robber barons and ostentatious display, when multitudes were needed to cater to the needs of the rich. 1. 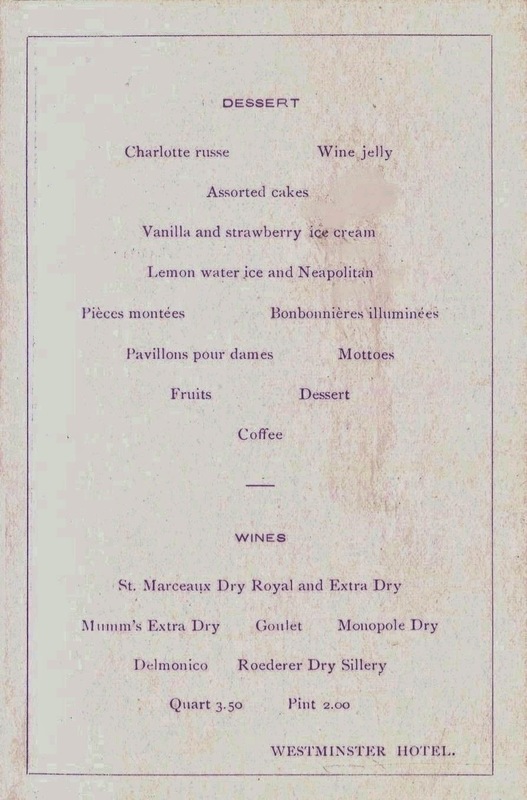 Supper menu from the large Americus Club Ball in January 1871. 2. Possibly Frank Koch, proprietor of the Amphitryon Restaurant at 335 Broadway, near Worth Street, and the New Mount St. Vincent Hotel on St. Nicholas Ave. and 148th Street. 3. New York Times, 10 February 1880. 4. Sivori was active in the Masons, although it is not known whether he was linked to this lodge. 5. New York Herald, 25 March 1893; New York Times, 26 March 1893. 6. 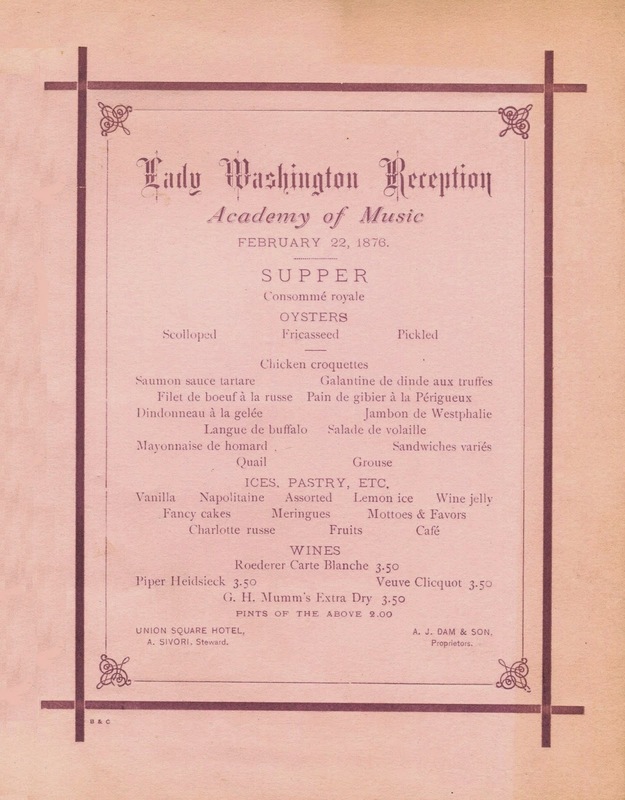 Sivori and Koch were still working together on 19 January 1882, when they catered the Old Guard Ball at the Academy of Music. 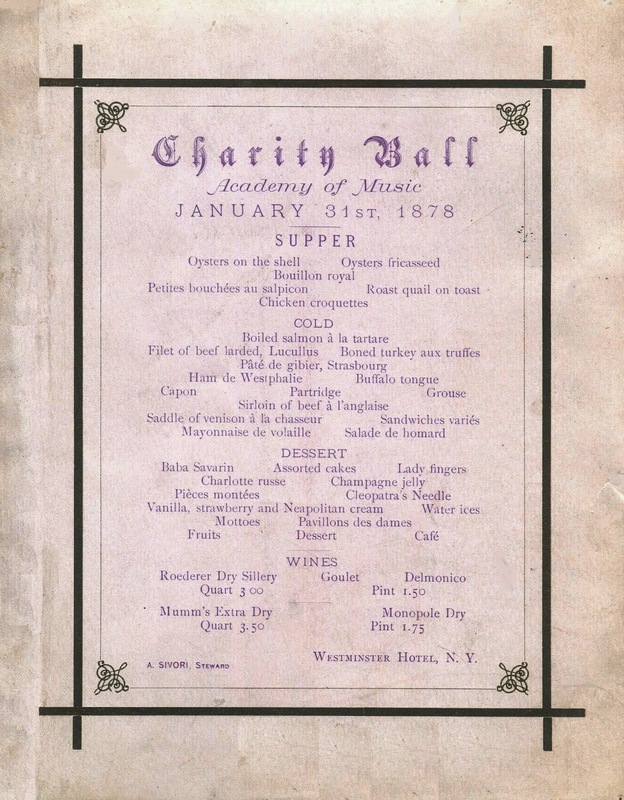 A silk menu from the event is in the Museum of the City of New York. Love the details about masks. Also, a big coincidence in relation to his dinner at the Montezuma in NM. I am working on a conference paper on Fred Harvey, who provided dining services for a few years there. 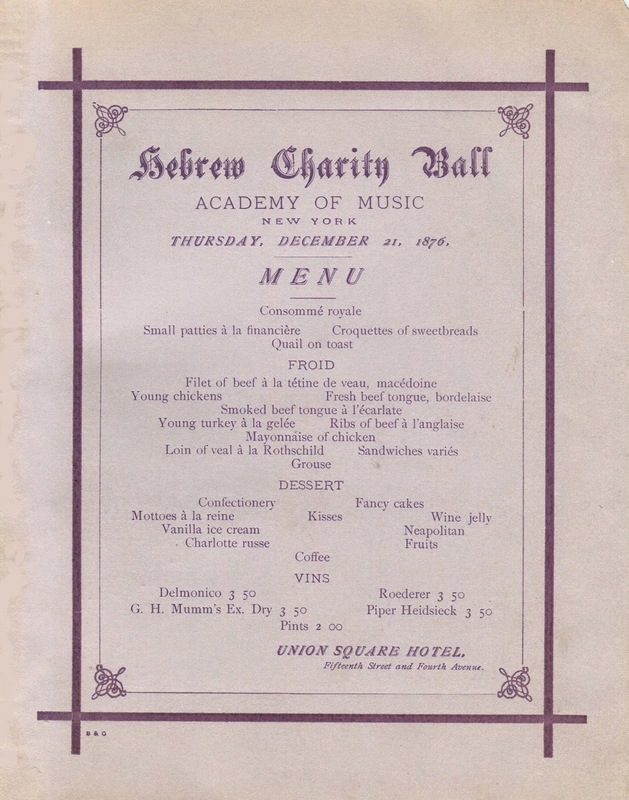 Interestingly, The Hebrew Charity Ball is the only menu here that does not include ham or shellfish, both of which would not comply with jewish dietary law ("kosher"). While I doubt that the menu and its preparation fully complied with other kosher laws, its interesting that they didnt serve these items. They also list something served "a la Rotschild" (also, only on this menu and not the others) which might appeal to the Jewish diner. Thank you for your comments. Yes, it seems reasonable that the organizing committee for the ball of the United Hebrew Charities would have selected dishes consistent with Jewish dietary law, working in consultation with the caterer Antonio Sivori. However, as far as I know, the Union Square Hotel did not have a kosher kitchen in which to prepare the supper.